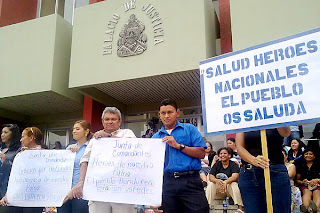 Honduras' Supreme Court President Jorge Rivera issued his verdict absolving the military commanders from abuse of authority and illegal expatriation of former President Manuel Zelaya on the grounds that there was a real and imminent danger to life and property in the country, from both foreigners and Zelaya's followers. The judge pointed to the actual violence instigated by Zelaya and his followers and his motto: Restitution or death. The courts declared the Armed Forces not guilty of violating the law for sending Zelaya into exile. According to this report, the defense was able to prove using intelligence reports that Venezuela and Cuba were taking part in the attempt to eliminate the Honduran constitution and that there were over 900 armed agents from Venezuela, Nicaragua and Spain in Honduras taking part in these political activities. 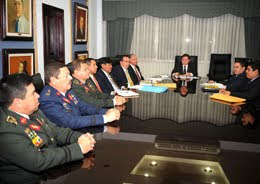 Since this is the only accusation that has been leveled against the institutions that took part in Zelaya's removal, it means that the arguments to promote an amnesty are only meant to protect Zelaya for the 24 counts of abuse of power, malfeasance, fraud, etc., against the Honduran people and his cohorts for similar charges against them. This morning, the most popular early morning talk show featured a group of the defense attorneys. Most of them were civilian lawyers. They agreed that if at any time they had suspected that the trial was going to be a sham, they would have resigned immediately. On the contrary, they were expecting to breeze through on the "state of necessity" argument and it turned out that the prosecution had prepared a counterargument. The prosecution argued that "state of necessity" didn't apply because the consequences were part of the duties that the Armed Forces are supposed to deal with. For instance, a fireman can't argue that he didn't try to stop a fire because he feared for his life, because he has been trained for that and it is his duty to fight the fire. Another of the arguments that the defense made was that the consequences of taking Zelaya out of the country, versus the possible loss of life, were disproportionate. I guess it was at this point where they had to log into evidence proof that Zelaya was taken out fully dressed, even his boots. It was in Costa Rica that he changed into pajamas and disheveled his hair. The civilian lawyers said they were surprised at the amount of evidence the military had and hinted of assassination of military officers. I think this has to do with the assassination of Zelaya's "edecan" who is generally believed to have been killed by Zelaya mercenaries because he was going to turn over evidence of Zelaya's behaviour. Later a Spanish lawyer, Professor of Constitutional Law, came on the program. He criticized the defense because they hadn't argued enough the state of necessity based on the defense of the constitutional system, which he had hoped they would, but instead had focused on the saving of lives. They also talked about a group of lawyers who support Zelaya who had presented an injunction in defense of Zelaya, but their writs were knocked out because they hadn't presented evidence of representing anyone, which, according to Honduran law, they must (unless the state acts directly). These lawyers said they didn't do that because it was a coup and the courts were partial and the whole political argument. They only want to present it at an international court. The Spanish lawyer called the argument ridiculous, because, as lawyers, they should know that before an international court takes on the case, they must first prove that they have exhausted the legal procedures in the country of origin. Also, they did mention that according to military intelligence there were over 900 agents from Venezuela, Nicaragua, Bolivia, etc., who were here involved in coordinating political activities and many with military training. And, according to the Supreme Tribunal of Accounts (like the US GAO), shortly before the events of June 28th, there were over 190 news media representatives from said country who were staying in hotels and riding in rented cars all paid by the President. This is why the original story came out so partial against Honduras.